Back pain is pain felt in the back. The back is divided into middle back pain (thoracic), lower back pain (lumbar) or coccydynia (tailbone or sacral pain) based on the segment affected. Neck pain (cervical), which is considered an independent entity, can involve similar processes. The lumbar area is the most common area for pain, as it supports most of the weight in the upper body. Episodes of back pain may be acute, sub-acute, or chronic depending on the duration. The pain may be characterized as a dull ache, shooting or piercing pain, or a burning sensation. Discomfort can radiate into the arms and hands as well as the legs or feet, and may include numbness, or weakness in the legs and arms. The majority of back pain seen in primary care is nonspecific with no identifiable causes. Common identifiable causes of back pain include degenerative or traumatic changes to the discs and facets joints, which can then cause secondary pain in the muscles, and nerves, and referred pain to the bones, joints and extremities. Diseases and inflammation of the gallbladder, pancreas, aorta, and kidneys may also cause referred pain in the back. Tumors of the verteba, neural tissues and adjacent structures can also manifest as back pain. Back pain is common, with about nine out of ten adults experiencing it at some point in their life, and five out of ten working adults having it every year. Some estimate up to 95% of Americans will experience back pain at some point in their lifetime. It is the most common cause of chronic pain, and is a major contributor of missed work and disability. For most individuals, back pain is self-limited. In most cases of herniated disks and stenosis, rest, injections or surgery have similar general pain resolution outcomes on average after one year. In the United States, acute low back pain is the fifth most common reason for physician visits and causes 40% of missed days off work. Additionally, it is the single leading cause of disability worldwide. Back pain is classified in terms of duration of symptoms. Subacute back pain lasts between 6 to 12 weeks. Chronic back pain lasts for greater than 12 weeks. There are many causes of back pain, including blood vessels, internal organs, infections, mechanical, and autoimmune causes. Approximately 90 percent of people with back pain are diagnosed with nonspecific acute back pain in which there is no serious underlying pathology. In approximately 10 percent of people, cause can be identified through diagnostic imaging. Less than 2 percent are attributed to secondary factors, with metastatic cancers and serious infections, such as spinal osteomyelitis and epidural abscesses, accounting for around 1 percent. In as many as 90 percent of cases, no physiological causes or abnormalities on diagnostic tests can be found. Nonspecific back pain can be due to back strain/sprain. The cause is peripheral injury to muscle or ligaments. The patient may or may not recall the cause. The pain can present acutely but in some cases can persist, leading to chronic pain. Chronic back pain in people with otherwise normal scans can result from central sensitization, where an initial injury causes a longer-lasting state of heightened sensitivity to pain. This persistent state maintains pain even after the initial injury has healed. Treatment of sensitization may involve low doses of anti-depressants and directed rehabilitation such as physical therapy. Spinal disk disease occurs when the nucleus pulposus, a gel-like material in the inner core of the vertebral disc, ruptures. Rupturing of the nucleus pulposus can lead to compression of nerve roots. Symptoms may be unilateral or bilateral, and correlate to the region of the spine affected. The most common region for spinal disk disease is at L4-L5 or L5-S1. The risk for lumbar disc disease is increased in overweight individuals due to the increased compressive force on the nucleus pulposus. Severe spinal cord compression is considered a surgical emergency and requires decompression to preserve motor and sensory function. Cauda equina syndrome refers to severe compression of the cauda equina and presents initially with pain followed by motor and sensory. Bladder incontinence is seen in later stages of the cauda equina syndrome. 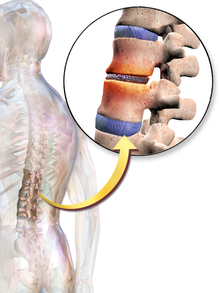 Spondylosis, or degenerative arthritis of the spine, occurs when the intervertebral disc undergoes degenerative changes, causing the disc to fail at cushioning the vertebrae. There is an association between intervertebral disc space narrowing and lumbar spine pain. The space between the vertebrae becomes more narrow, resulting in compression and irritation of the nerves. Spondylolithesis is the anterior shift of one vertebra compared to the neighboring vertebra. It is associated with age-related degenerative changes as well as trauma and congenital anomalies. Spinal stenosis can occur in cases of severe spondylosis, spondylotheisis and age associated thickening of the ligamentum flavum. Spinal stenosis involves narrowing of the spinal canal and typically presents in patients greater than 60 years of age. Neurogenic claudication can occur in cases of severe lumbar spinal stenosis and presents with syptoms of pain in the lower back, buttock or leg that is worsened by standing and relieved by sitting. Vertebral compression fractures occurs in 4 percent of patients presenting to primary care with low back pain. Risk factors include age, female gender, history of osteoporosis, and chronic glucocorticoid use. Fractures can occur due to trauma but in many cases can be asymptomatic. Common infectious causes of back pain include osteomyelitis, septic diskitis, paraspinal abscess, and epidural abscess. Infectious causes that lead to back pain involve various structures surrounding the spine. Osteomyelitis is the bacterial infection of the bone. Vertebral osteomyelitis is most commonly caused by staphylococci. Risk factors include skin infection, urinary tract infection, IV catheter use, IV drug use, previous endocarditis, and lung disease. Spinal epidural abscess is also commonly caused by severe infection with bacteremia. Risk factors include recent epidural, IV drug use, or recent infection. Spread of cancer to the bone or spinal cord can lead to back pain. Bone is one of the most common sites of metastatic lesions. Patients typically have a history of malignancy. Common types of cancer that present with back pain include multiple myeloma, lymphoma, leukemia, spinal cord tumors, primary vertebral tumors, and prostate cancer. Back pain is present in 29% of patients with systemic cancer. Unlike other causes of back pain which common affect the lumbar spine, the thoracic spine is most commonly affected. The pain can be associated with systemic symptoms such as weight loss, chills, fever, nausea and vomiting. Unlike other causes of back pain, neoplasm-associated back pain is constant, dull, poorly localized, and worst with rest. Metastasis to the bone also increases the risk of spinal cord compression or vertebral fractures which requires emergent surgical treatment. Inflammatory arthritides such as ankylosing spondylitis, psoriatic arthritis, rheumatoid arthritis, and systemic lupus erythematosus can all cause varying levels of joint destruction. Among the inflammatory arthritides, ankylosing spondylitis is most closely associated with back pain due to the inflammatory destruction of the bony components of the spine. Ankylosing spondylitis is common in young men and presents with a range of possible symptoms such as uveitis, psoriasis, and inflammatory bowel disease. Back pain can also be due to referred pain from another source. Referred pain occurs when pain is felt at a location different from the source of the pain. Disease processes that can present with back pain include pancreatitis, kidney stones, severe urinary tract infections, and abdominal aortic aneurysms. Heavy lifting, obesity, sedentary lifestyle, and lack of exercise can increase a person's risk of back pain. People who smoke are more likely to experience back pain than others. Poor posture and weight gain in pregnancy are also risk factors for back pain. In general, fatigue can worsen pain. Diagnostic work-up for acute back pain. Initial assessment of back pain consists of a history and physical examination. Important characterizing features of the back pain include location, duration, severity, history of prior back pain, and possible trauma. Other important components of the patient history include age, physical trauma, prior history of cancer, fever, weight loss, urinary incontinence, progressive weakness, or expanding sensory changes, which can elicit red flags indicating a medical urgent condition. Physical examination of the back should assess for posture and deformities. Pain elicited by palpating certain structures may be helpful in localizing the affected area. A neurologic exam is needed to assess for changes in gait, sensation, and motor function. Determining if there is radicular symptoms, such as pain, numbness, or weakness that radiates down limbs, is important for differentiating between central and peripheral causes of back pain. The straight leg test is a maneuver used to determine the presence of lumbosacral radiculopathy. Radiculopathy occurs when there is irritation in the nerve root, causing neurologic symptoms, such as numbness and tingling. Non-radicular back pain is most commonly caused by injury to the spinal muscles or ligaments, degenerative spinal disease, or a herniated disk. Disk herniation and foraminal stenosis are the most common causes of radiculopathy. Imaging of the spine and laboratory tests is not recommended during the acute phase. This assumes that there is no reason to expect that the person has an underlying problem. In most cases, the pain goes away naturally after a few weeks. Typically, people who do seek diagnosis through imaging are not likely to have a better outcome than those who wait for the condition to resolve. Magnetic resonance imaging is the preferred modality for the evaluation of back pain and visualize bone, soft tissue, nerves, and ligaments. X-rays are a less costly initial option offered to patients with a low clinical suspicion of infection or malignancy and is combined with laboratory studies for interpretation. Imaging is not needed in the majority of individuals with back pain. In cases of acute back pain, MRI is recommended for individuals with major risk factors/clinical suspicion for cancer, spinal infection, or severe progressive neurological deficits. For patients with subacute to chronic back pain, MRI is recommended if there are minor risk factors for cancer, risk factors for ankylosing spondylitis, risk factors for vertebral compression fracture, significant trauma, or symptomatic spinal stenosis. Early imaging studies during the acute phase do not improve care or prognosis in patients. Imaging findings are not correlated with severity or outcome. Laboratory studies are used to if there are suspicions for autoimmune causes, infection, or malignancy. Laboratory testing may include white blood cell (WBC) count, erythrocyte sedimentation rate (ESR), and C-reactive protein (CRP). Patients with uncomplicated back pain should be encouraged to remain active and return to normal activities. Massage therapy may give short-term pain relief, but not functional improvement, for those with acute lower back pain. It may also give short-term pain relief and functional improvement for those with long-term (chronic) and sub-acute lower pack pain, but this benefit does not appear to be sustained after 6 months of treatment. There does not appear to be any serious adverse effects associated with massage. Spinal manipulation is a widely-used method of treating back pain. Immediate benefits can be significant, but long-term benefits can be variable. "Back school" is an intervention that consists of both education and physical exercises. There is no strong evidence supporting the use of Back School for treating acute, sub-acute, or chronic non-specific back pain. Long-term use of opioids has not been tested in order to determine if it is effective or safe for treating chronic lower back pain. For severe back pain not relieved by NSAIDs or acetaminophen, opioids may be used. Opioids may not be better than NSAIDs or antidepressants for chronic back pain with regards to pain relief and gain of function. When a herniated disc is compressing the nerve roots, hemi- or partial- laminectomy or discectomy may be performed, in which the material compressing on the nerve is removed. A mutli-level laminectomy can be done to widen the spinal canal in the case of spinal stenosis. A foraminotomy or foraminectomy may also be necessary, if the vertebrae are causing significant nerve root compression. A discectomy is performed when the intervertebral disc has herniated or torn. It involves removing the protruding disc, either a portion of it or all of it, that is placing pressure on the nerve root. Total disc replacement can also be performed, in which the source of the pain (the damaged disc) is removed and replaced, while maintaining spinal mobility. When an entire disc is removed (as in discectomy), or when the vertebrae are unstable, spinal fusion surgery may be performed. Spinal fusion is a procedure in which bone grafts and metal hardware is used to fix together two or more vertebrae, thus preventing the bones of the spinal column from compressing on the spinal cord or nerve roots. Although back pain does not typically cause permanent disability, it is a significant contributor to physician visits and missed work days in the United States, and is the single leading cause of disability worldwide. The American Academy of Orthopaedic Surgeons report approximately 12 million visits to doctor's offices each year are due to back pain. Missed work and disability related to low back pain costs over $50 billion each year in the United States. In the United Kingdom in 1998, approximately £1.6 billion per year was spent on expenses related to disability from back pain. ^ a b c Burke GL (2008). "Chapter 3: The Anatomy of Pain in Backache". Backache:From Occiput to Coccyx. Vancouver, BC: MacDonald Publishing. ISBN 978-0-920406-47-2. ^ Deyo, Richard A.; Weinstein, James N. (2001-02-01). "Low Back Pain". New England Journal of Medicine. 344 (5): 363–370. doi:10.1056/NEJM200102013440508. ISSN 0028-4793. PMID 11172169. ^ Cohen, Steven P. (February 2015). "Epidemiology, diagnosis, and treatment of neck pain". Mayo Clinic Proceedings. 90 (2): 284–299. doi:10.1016/j.mayocp.2014.09.008. ISSN 1942-5546. PMID 25659245. ^ a b c d e Manchikanti L, Singh V, Datta S, Cohen SP, Hirsch JA (Jul–Aug 2009). 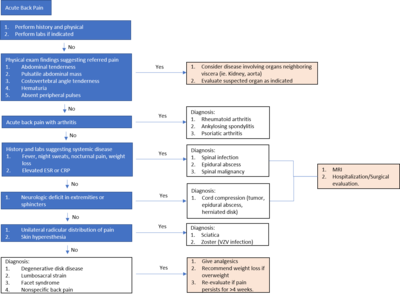 "Comprehensive review of epidemiology, scope, and impact of spinal pain". Pain Physician. 12 (4): E35–70. PMID 19668291. ^ a b c Chou, Roger; Qaseem, Amir; Snow, Vincenza; Casey, Donald; Cross, J. Thomas; Shekelle, Paul; Owens, Douglas K.; Clinical Efficacy Assessment Subcommittee of the American College of Physicians; American College of Physicians (2007-10-02). "Diagnosis and treatment of low back pain: a joint clinical practice guideline from the American College of Physicians and the American Pain Society". Annals of Internal Medicine. 147 (7): 478–491. ISSN 1539-3704. PMID 17909209. ^ a b c d e f g h i j Walls, Ron M.; Hockberger, Robert S.; Gausche-Hill, Marianne (2017-05-18). Rosen's emergency medicine : concepts and clinical practice. Walls, Ron M.,, Hockberger, Robert S.,, Gausche-Hill, Marianne (Ninth ed.). Philadelphia, PA. ISBN 9780323354790. OCLC 989157341. ^ a b Slipman, Curtis W.; et al., eds. (2008). Interventional spine : an algorithmic approach. Philadelphia, PA: Saunders Elsevier. p. 13. ISBN 978-0-7216-2872-1. ^ a b author., Stern, Scott D. C. (2014-10-28). Symptom to diagnosis : an evidence-based guide. ISBN 9780071803441. OCLC 894996548. ^ a b Orendácová, J.; Cízková, D.; Kafka, J.; Lukácová, N.; Marsala, M.; Sulla, I.; Marsala, J.; Katsube, N. (August 2001). "Cauda equina syndrome". Progress in Neurobiology. 64 (6): 613–637. doi:10.1016/S0301-0082(00)00065-4. ISSN 0301-0082. PMID 11311464. ^ Woolf, Clifford J (2011-03-01). "Central sensitization: Implications for the diagnosis and treatment of pain". Pain. 152 (3 Suppl): S2–15. doi:10.1016/j.pain.2010.09.030. ISSN 0304-3959. PMC 3268359. PMID 20961685. ^ Verdu, Bénédicte; Decosterd, Isabelle; Buclin, Thierry; Stiefel, Friedrich; Berney, Alexandre (2008-01-01). "Antidepressants for the treatment of chronic pain". Drugs. 68 (18): 2611–2632. doi:10.2165/0003495-200868180-00007. ISSN 0012-6667. PMID 19093703. ^ a b c d e f g h i HerausgeberIn., Jameson, J. Larry (2018-08-13). Harrison's principles of internal medicine. ISBN 9781259644030. OCLC 1041928452. ^ Raastad, Joachim (2015). "The association between lumbar spine radiographic features and low back pain: A systematic review and meta-analysis". Seminars in Arthritis and Rheumatism. 44 (5): 571–585. doi:10.1016/j.semarthrit.2014.10.006. PMID 25684125. ^ Jarvik, Jeffrey G.; Deyo, Richard A. (2002-10-01). "Diagnostic evaluation of low back pain with emphasis on imaging". Annals of Internal Medicine. 137 (7): 586–597. ISSN 1539-3704. PMID 12353946. ^ Thiruganasambandamoorthy, Venkatesh; Turko, Ekaterina; Ansell, Dominique; Vaidyanathan, Aparna; Wells, George A.; Stiell, Ian G. (July 2014). "Risk factors for serious underlying pathology in adult emergency department nontraumatic low back pain patients". The Journal of Emergency Medicine. 47 (1): 1–11. doi:10.1016/j.jemermed.2013.08.140. ISSN 0736-4679. PMID 24725822. ^ a b Chou, Roger; Qaseem, Amir; Owens, Douglas K.; Shekelle, Paul; Clinical Guidelines Committee of the American College of Physicians (2011-02-01). "Diagnostic imaging for low back pain: advice for high-value health care from the American College of Physicians". Annals of Internal Medicine. 154 (3): 181–189. CiteSeerX 10.1.1.690.1604. doi:10.7326/0003-4819-154-3-201102010-00008. ISSN 1539-3704. PMID 21282698. ^ Chou, Roger; Fu, Rongwei; Carrino, John A.; Deyo, Richard A. (2009-02-07). "Imaging strategies for low-back pain: systematic review and meta-analysis". Lancet. 373 (9662): 463–472. doi:10.1016/S0140-6736(09)60172-0. ISSN 1474-547X. PMID 19200918. ^ Oland, G.; Hoff, T. G. (1996-09-01). "Intraspinal cross-section areas measured on myelography--computed tomography. The relation to outcome in nonoperated lumbar disc herniation". Spine. 21 (17): 1985–1989, discussion 1990. doi:10.1097/00007632-199609010-00009. ISSN 0362-2436. PMID 8883199. ^ Kapeller, P.; Fazekas, F.; Krametter, D.; Koch, M.; Roob, G.; Schmidt, R.; Offenbacher, H. (1997). "Pyogenic infectious spondylitis: clinical, laboratory and MRI features". European Neurology. 38 (2): 94–98. doi:10.1159/000113167. ISSN 0014-3022. PMID 9286631. ^ Deyo, R. A.; Diehl, A. K. (May 1988). "Cancer as a cause of back pain: frequency, clinical presentation, and diagnostic strategies". Journal of General Internal Medicine. 3 (3): 230–238. doi:10.1007/BF02596337. ISSN 0884-8734. PMID 2967893. ^ a b Steffens D, Maher CG, Pereira LS, Stevens ML, Oliveira VC, Chapple M, Teixeira-Salmela LF, Hancock MJ (January 2016). "Prevention of Low Back Pain: A Systematic Review and Meta-analysis". JAMA Internal Medicine. 176 (2): 199–208. doi:10.1001/jamainternmed.2015.7431. PMID 26752509. ^ Baron, R; Binder, A; Attal, N; Casale, R; Dickenson, AH; Treede, RD (July 2016). "Neuropathic low back pain in clinical practice". European Journal of Pain. 20 (6): 861–73. doi:10.1002/ejp.838. PMC 5069616. PMID 26935254. ^ a b c Stockwell, Serena (2017-05-01). "New Clinical Guideline for Low Back Pain Says Try Nondrug Therapies First". American Journal of Nursing. 117 (5): 16. doi:10.1097/01.naj.0000516263.01592.38. ISSN 0002-936X. PMID 28448354. ^ Dahm, Kristin Thuve; Brurberg, Kjetil G.; Jamtvedt, Gro; Hagen, Kåre Birger (2010-06-16). "Advice to rest in bed versus advice to stay active for acute low-back pain and sciatica". The Cochrane Database of Systematic Reviews (6): CD007612. doi:10.1002/14651858.CD007612.pub2. ISSN 1469-493X. PMID 20556780. ^ Yeganeh, Mohsen (May 1, 2017). "The effectiveness of acupuncture, acupressure and chiropractic interventions on treatment of chronic nonspecific low back pain in Iran: A systematic review and meta-analysis". Complementary Therapies in Clinical Practice. 27: 11–18. doi:10.1016/j.ctcp.2016.11.012. PMID 28438274 – via ClinicalKey. ^ Burke GL (2008). "Chapter 8: The Techniques of Traction and Manipulation of the Spine". Backache:From Occiput to Coccyx. Vancouver, BC: MacDonald Publishing. ISBN 978-0-920406-47-2. ^ a b Parreira, Patrícia; Heymans, Martijn W.; van Tulder, Maurits W.; Esmail, Rosmin; Koes, Bart W.; Poquet, Nolwenn; Lin, Chung-Wei Christine; Maher, Christopher G. (2017). "Back Schools for chronic non-specific low back pain". The Cochrane Database of Systematic Reviews. 8: CD011674. doi:10.1002/14651858.CD011674.pub2. ISSN 1469-493X. PMID 28770974. ^ a b Sudhir, Amita; Perina, Debra (2018). "Musculoskeletal Back Pain". Rosen's Emergency Medicine: Concepts and Clinical Practice. Elsevier. pp. 569–576. ISBN 9780323354790 – via ClinicalKey. ^ a b Chaparro, LE; Furlan, AD; Deshpande, A; Mailis-Gagnon, A; Atlas, S; Turk, DC (27 August 2013). "Opioids compared to placebo or other treatments for chronic low-back pain". The Cochrane Database of Systematic Reviews (8): CD004959. doi:10.1002/14651858.CD004959.pub4. PMID 23983011. ^ Terry Canale, S.; Azar, Frederick M.; Beaty, James H. (2016-11-21). Campbell's operative orthopaedics. Azar, Frederick M.,, Canale, S. T. (S. Terry),, Beaty, James H.,, Preceded by: Campbell, Willis C. (Willis Cohoon), 1880-1941. (Thirteenth ed.). Philadelphia, PA. ISBN 9780323374620. OCLC 962333989. ^ Jankovic, Joseph; Daroff, Robert B.; Mazziotta, John C.; Pomeroy, Scott Loren (2015-11-23). Bradley's neurology in clinical practice. Daroff, Robert B.,, Jankovic, Joseph,, Mazziotta, John C.,, Pomeroy, Scott Loren,, Bradley, W. G. (Walter George) (Seventh ed.). London. ISBN 9780323287838. OCLC 932031625. ^ Benzel, Edward C.; Steinmetz, Michael P. (2016-09-02). Benzel's spine surgery : techniques, complication avoidance, and management. Steinmetz, Michael P.,, Benzel, Edward C. (Fourth ed.). Saint Louis. ISBN 9780323400305. OCLC 953660061. ^ a b c d e f Honorio Benzon, MD; James p. Rathmell, MD; Christopher l. Wu, MD; Dennis Turk, PhD; Charles e. Argoff, MD; Robert w Hurley, MD (2013-09-12). Practical management of pain. Benzon, Honorio T.,, Rathmell, James P.,, Wu, Christopher L.,, Turk, Dennis C.,, Argoff, Charles E.,, Hurley, Robert W. (Fifth ed.). Philadelphia, PA. ISBN 9780323083409. OCLC 859537559. Qaseem, Amir; Wilt, Timothy J.; McLean, Robert M.; Forciea, Mary Ann (14 February 2017). "Noninvasive Treatments for Acute, Subacute, and Chronic Low Back Pain: A Clinical Practice Guideline From the American College of Physicians". Annals of Internal Medicine. 166 (7): 514–530. doi:10.7326/M16-2367. PMID 28192789. Wikimedia Commons has media related to Back pain.